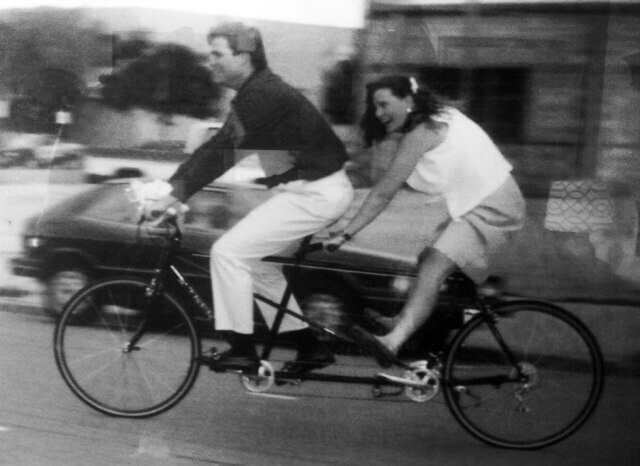 It’s beautiful outside and it’s Valentine’s Day, which means it’s the perfect day to ride a tandem bicycle with your favorite person. Don’t be fooled; it’s easier to ride a tandem than you might think. I hear a lot of people say, “Oh, I don’t think it would work for us. We’d be fighting for control the whole time.” It is true, you have to work as a team. But the rewards are fabulous. My in-laws gave Mark and me a tandem as a wedding gift. I am still unsure how our good friend, Gary Thorton, managed to ride that bike on his own from Turin Bicycles (7th and Lincoln in Denver) to 18th and Arapahoe through downtown traffic at 5 p.m. on a Friday to this little French bistro where we were having our rehearsal dinner. But when he arrived, we were thrilled and incredibly impressed. My father-in-law thought he was joking when he called the tandem our marriage tool. But it was true. We had to work as a team. We had to communicate with each other. We had to trust each other. It didn’t take long for us to get the hang of it. I loved it immediately and it quickly became my favorite form of cycling. We got so good at riding our tandem we could navigate the tightest switchbacks on the Cherry Creek bike path without stopping or even putting our feet down. We’ve gone through a couple of tandems in the 20+ years we’ve been married. We don’t have a one right now. We lost the last one we had in the fire a couple of years ago and I miss it all the time. I’m keeping my eyes open for a new one though. So next time someone says, “Try a tandem.” Do it. You will be surprised how easy and fun it is. Best marriage tool ever!